When one thinks of art crime, a Hollywood image is conjured, one of black-clad cat burglars, thieves in top hats and white gloves, and perhaps the occasional criminal collector twirling his waxed moustache as he cackles maniacally over a stolen horde in his Bavarian castle. But the truth behind art crime is far more sinister, and more intriguing. Art crime has its share of cinematic thefts and larger-than-life characters, but it is also the realm of transnational organized crime groups and terrorists, and is integrally linked to the drug and arms trades. Since the Second World War, art crime has shifted from a relatively innocuous, often ideological crime, into a major international problem, considered by some to be the third-highest grossing criminal trade worldwide. This rich volume, edited by Noah Charney and published by Palgrave, features work by the most respected and knowledgeable experts in this interdisciplinary subject, both professionals and scholars. 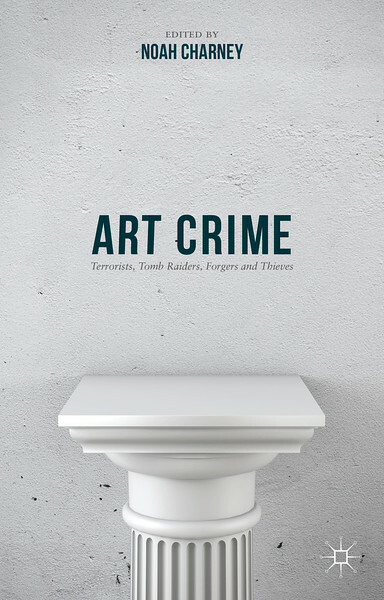 It is essential reading for criminologists, archaeologists, anthropologists, art historians, and all those interested in art crime. Includes contributions by: George H.O. Abungu, Stefano Alessandrini, Matthew Bogdanos, Toby J.A. Bull, Neil Brodie, Duncan Chappell, Noah Charney, Simon A. Cole, Tess Davis, Asif Efrat, Paolo Girogio Ferri, David Gill, Blake Gopnik, Patricia Kennedy Grimsted, Karl von Habsburg-Lothringen, Jerome Hasler, Charles Hill, Saskia Hufnagel, Martin Kemp, John Kerr, Simon Mackenzie, Christopher A. Marinello, Vernon Rapley, Lawrence Rothfield, Laurie W. Rush, Francesco Rutelli, Howard Spiegler, Arthur Tompkins, Christos Tsirogiannis and Bill Wei.